Innovation and strategy, two words that are often used, get many people excited and just as many confused. Innovation strategy, what is it, why do you need one and how do I create one? Strategy comes from the Greek word ‘στρατηγία’ (stratēgia) which consist of the words ‘stratos’ (army), and ‘agein’ (to lead). In order to lead the army, one needs to know and communicate to the troops some straightforward things so that the troops know their objectives, why those are important, where to go to etc. Innovation has Latin roots, ‘innovare’, to alter or renew. In modern day innovation management, we use a more goal oriented definition of the word, such as ‘the creation and capture of new value in new ways’ or the ‘successful introduction of new product, service, business model or process’. 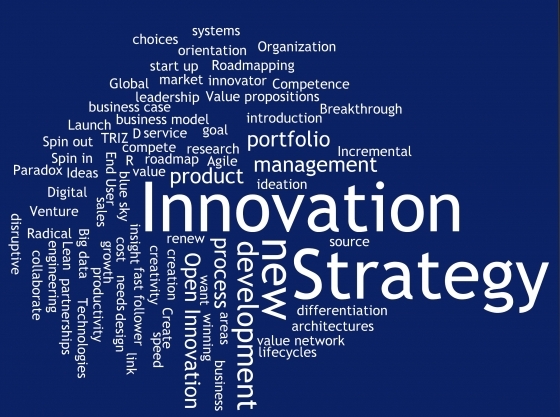 In this article I will give a brief overview of what an Innovation strategy is. Let’s examine them one by one. The goals and aspirations for innovation should be derived from and linked to the overall ambition of the business. However, in innovation, they address more innovation-specific aspects such as: whether we want to be an innovator, or a fast follower, or whether we want to compete on differentiation of cost leadership. Philips has as a brand tagline “innovation that matters to you”. It is a clear statement. Innovation goals are also important to state. For instance, 3M and others use a goal of % of sales from new products. 3M calls it the New Product Vitality Index (NPVI), sales from products that have been developed in the past five years. In 2008, 25 percent of the company’s revenue came from products created in the last five years. 3M expects to see its NVPI increase to 37% by 2017. Not a bad goal to have, as with a higher number of newer products, margins will likely continue to improve. Philips also made clear choices. We separated HealthTech and Lighting businesses to allow them to make independent strategic choices. The business strategy defines which markets or market segments we want to be in. The Innovation strategy clarifies which markets / segments are most important ones from an innovation perspective. But more importantly, it defines which types of innovation we will go after and how much we will invest in those different types. Do we invest in the core, and how much in radical innovation or new market development? Many companies work with a strategic framework to steer and to check whether they invest in the right things. Dutch science-based company DSM moved from a portfolio of over 75% in petrochemicals, engineering plastics and base chemicals in 1995 to almost only nutrition and performance materials now. Here, corporate and innovation strategy went hand in hand in terms of business portfolio restructuring and investing in the right areas for innovation. But also Google is a good example. Cars, and even more mobility is a huge and data-rich market that will only become more so. Again it makes sense to choose it as a “where to compete”. In Philips we also made clear choices. Taking the HealthTech side we have made choices in which areas to focus on, see what our CTO Henk van Houten shared on LinkedIn. How to win addresses (for each segment or market) how we will win the customers. Which key requirements of the customer are we going to lead in and differentiate on? Will it be on performance, design, cost, new features, or completely new business models? Well-known example is Apple, competing on design and seamlessness. An important element of strategy is timing. What should our clock speed be? How often do we introduce new propositions? Is it different than that of others in our industry? We typically think of going faster in these cycles. And indeed apparel companies like Benneton at first and Zara do exactly that. Benneton can increase volumes of high-runners in the stores, while Zara refreshes its’ offering within a season often to ensure consumers never walk by its store, as there might be something new in it. But you can also think of going slower. It was said that BMW kept longer product lifecycles than its competitors in terms of the look of the car (less so the technology and features inside) on purpose, providing its customers with the value of not in a few years already having the old model, and also keeping the 2nd hand value high. What technologies do we need to excel in? Now and in the future? Which competences are important to have, at what level and how do we develop to achieve this? What do we do ourselves and what to we collaborate on or source from others. Which are our key innovation partnerships? What resources do we need in terms of systems, IT? You may say that this is a long list of questions, and you are right. A good strategy is a set of smart choices on important questions. Smart in terms of being well-informed, based on insights and data, and in terms of reinforcing each other. That is what every strategy is. So also an Innovation strategy. And a good Innovation strategy starts with the business strategy, but it also informs and sharpens the business strategy. It has a bi-directional and clear link to the business strategy, which basically answers the same questions from an integral business point of view, including other ‘functional’ (for the lack of a better term) strategies like the marketing strategy, operations strategy etc. Do we have an explicit Innovation strategy? Is our Innovation strategy well linked to the business strategy: do they go after the same goals and in the same way? innovation project portfolio and your roadmap? Is our Innovation strategy well-articulated and well deployed in the organization so that teams can make the right decisions in their innovation journeys? teams). Once you have cracked the nut on how to deploy, start doing that, again in conversations. Look forward to your comments and thoughts!